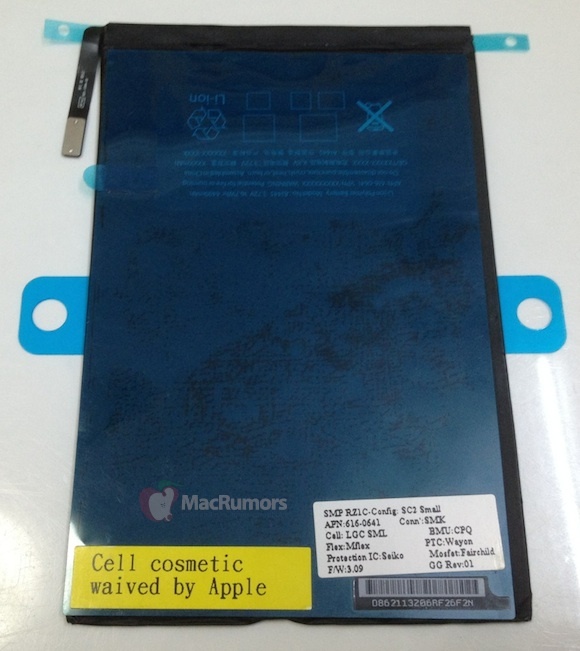 MacRumors has received a pair of photos showing what is claimed to be the battery from Apple's forthcoming "iPad mini". The photos show a battery carrying a model number of A1445 and an Apple part number of 616-0641. The battery runs at 3.72 volts, offering 16.7 Whr of energy on 4490 mAh of charge. While we can not confirm the authenticity of the part, the markings are consistent with those seen on batteries from other Apple products. The battery's proportions also seem to fit fairly well with what is expected for the iPad mini, although the exact dimensions of the part are unknown. The 16.7 watt-hour capacity for the iPad mini battery unsurprisingly places the device between the iPhone 5 at 5.45 watt-hours and the third-generation full-size iPad at 42.5 watt-hours. Given that the iPad mini has been said to be based more on the iPad 2 and lack a Retina display, the iPad mini's battery may be more appropriately compared to the 25 watt-hour battery of the iPad 2. The battery is clearly not yet an official part ready for shipping, as it contains placeholders for several portions of regulatory text and blank rectangular placeholders for a number of regulatory logos. It seems likely, however, that this is the final design simply awaiting final certification. Apple is expected to introduce the iPad mini at a media event all but confirmed to be scheduled for October 23. The Kindle Fire killer you mean. This won't kill the regular Kindle e-ink readers. by a long shot. Only if you mean the Kindle Fire. they must have this thing kept under serious wraps cuz there isn't nearly as many part leaks as the iPhone 5. "Cell cosmetic waived by Apple"
This is a FAKE. Apple never ever waives cosmetics, least of all for cells! Does anybody else think that the name "iPad Mini" is a bad name? Can't they think of something more creative?